Make Ahead Paleo Turkey Gravy. 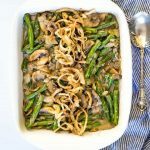 Make this fantastic gravy the day before Thanksgiving to save time on the day, you’ll LOVE it!! Here are just a few of the ingredients and kitchen gadgets you’ll need to make my Paleo Turkey Gravy. 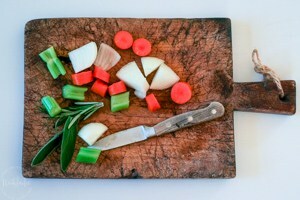 Here is a simple step by step guide,with photos for making my Paleo Turkey Gravy. The full printable recipe is at the end of the post. Step 1 – Preheat your oven to 450F and prepare and chop all the vegetables as directed in the recipe. 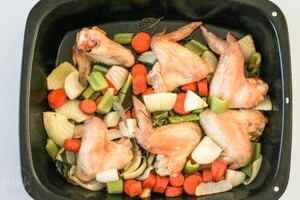 Step 2 – Add the chicken wings, olive oil, carrots, onion, and celery in a large roasting pan and cook for 45 minutes. Step 3 – After 45 minutes remove the pan and put it on the stovetop, then using a potato masher smash up the vegetables and chicken wings to release more of the flavors. Step 4 – Mix the tapioca starch with cold water. 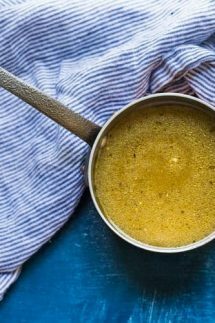 Add the remaining water, mixed tapioca starch, white wine, and bay leaves, to the large roasting pan with the chicken wings then turn the stove onto a medium heat and using a wooden spoon or spatula deglaze the pan and scrape up the bits from the bottom. Step 5 – Simmer for 30 minutes then pour it through a large sieve, let cool, and refrigerate or freeze for Thanksgiving. 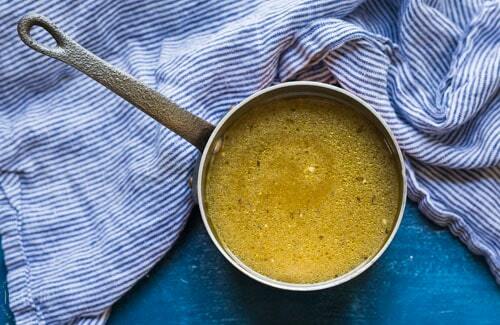 This Paleo Turkey gravy is ready to serve as it is (though it has no Turkey yet!) or you can add the turkey juices as shown in the recipe card. Like this? You’ll Love My other Paleo Thanksgiving Recipes! 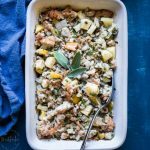 You’ ll love my easy, healthy, Paleo Thanksgiving Turkey with Herb Rub, it’s has such a great fresh flavor! 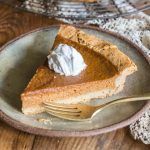 If you’ve enjoyed my Paleo Thanksgiving Turkey then you must try my easy Paleo Pumpkin Pie recipe with a made from scratch Paleo pie Crust and topped with fabulous coconut milk whipped cream! Save time this Thanksgiving and try my make ahead Paleo Turkey Gravy! Mix the chicken wings, olive oil, carrots, onion, and celery in a large roasting pan and cook for 45 minutes. Remove the pan from the oven and put it on the stovetop, then using a potato masher smash up the vegetables and chicken wings a bit to release more of the flavors. Mix the tapioca starch with three tbsp cold water (taken from the 2 quarts water you'll add to the gravy) and mix well to combine. 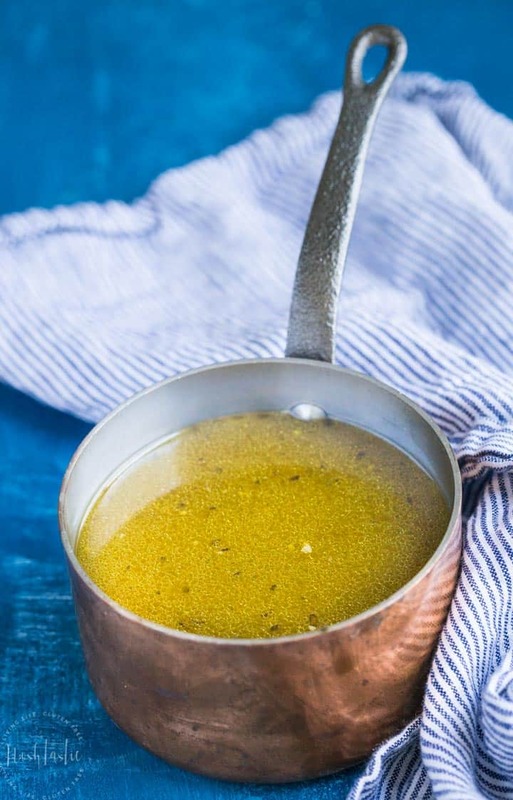 Add the remaining water, mixed tapioca starch, white wine, and bay leaves, to the large roasting pan with the chicken wings then turn the stove onto a medium head and using a wooden spoon or spatula deglaze the pan and scrape up the bits from the bottom. Simmer on a medium high heat, stirring frequently, for 30 minutes, the gravy should reduce down. Pour the gravy through a large sieve, let cool, and refrigerate or freeze for later. This gravy is ready to serve as it is, or you can follow the directions below if you plan to serve it with your Thanksgiving Turkey. On the day your turkey is cooked remove it from the oven, cover it with foil and set aside to let it rest. Skim the fat off the top of the turkey juices. Now add the make ahead gravy to the pan with the turkey juices and scrape up any bits from the bottom of the pan. Let it simmer for about five minutes on a medium heat. 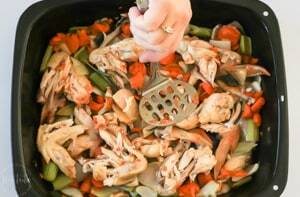 Taste the gravy, season with salt and pepper, and then run it through a sieve again. If you need to thicken it more, you can add another two to three tablespoons of tapioca starch to a little cold water as before. Remove the gravy from the heat, add in a little of the tapioca starch mixture and stir really well, return to the heat to thicken it up. 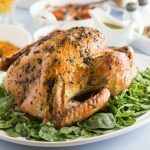 TURKEY JUICES - If you use a frozen turkey uncovered in the oven it may not yield a whole lot of turkey juices that you can add to your gravy, so just be aware of that. A fresh turkey is best, and the juices may evaporate more if the bird is uncovered for a long time in a very hot oven. If it comes with giblets then you may want to simmer them in a pan for a couple hours to make a little broth if you think your turkey won't make much juice, or you can simply have the gravy as it is, but it technically won't be 'turkey' gravy. FLAVORED TURKEY - if you stuff your turkey with citrus, garlic or any other yummy flavors then that will also be present in the juices and will affect the flavor of the finished gravy, it won't necessarily be bad but just be aware of that.